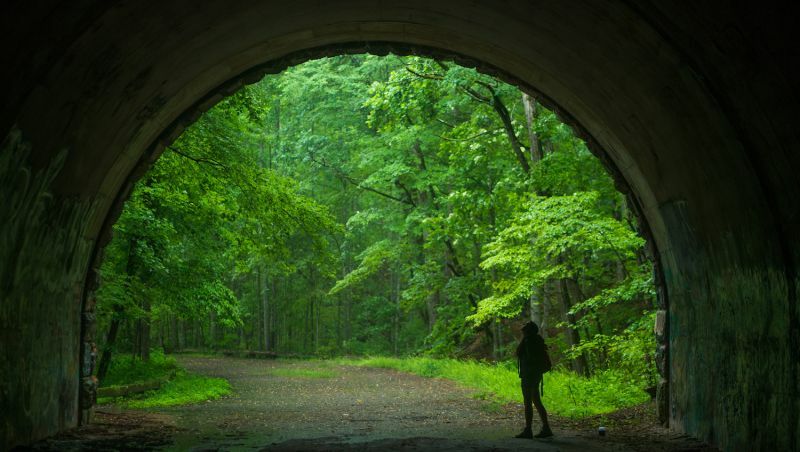 The Road to Nowhere ends at a tunnel inside North Carolina's Great Smoky Mountains National Park. If you want to venture farther, you have to do it by foot. The Road to Nowhere is a real road in Bryson City that ends at a tunnel inside Great Smoky Mountains National Park. If you want to venture farther, you have to do it by foot. When you're finished exploring, visit waterfalls in the Great Smoky Mountains National Park and get a taste of small town mountain life. The Road to Nowhere is a quick, 8-mile drive outside Bryson City. Before you go, have breakfast and coffee with the locals at the Everett Street Diner or at Mountain Perks, both on the way to Nowhere. After breakfast, head straight up Everett Street out of Bryson City and don’t make any turns. On the map, it’s called Lakeview Drive, but the road signs are marked Fontana Road. You’ll pass Swain County High School and eventually see a sign that reads, “You have entered Great Smoky Mountains National Park.” You’ll also see a more intriguing sign: “The Road to Nowhere – A Promise Broken.” The road ends at a barrier with the tunnel beyond. The road got its name from a dispute in the 1930s and 40s when Swain County gave up the majority of its private land so the federal government could create Fontana Lake and Great Smoky Mountains National Park. People had to move, family cemeteries were cut off, and the former road was buried beneath the waters of the lake. The federal government made an agreement with Swain County to build a new road along the lake’s north shore, but environmental issues stopped construction. With no resolution, now decades later, the road still goes nowhere. Now that you’ve gotten a taste of the serenity of Great Smoky Mountains National Park, turn around and go see some beautiful and relaxing waterfalls. From the Road to Nowhere, make your way back to town and take a left on Depot Street. Follow the signs to Deep Creek Tube Center & Campground, making sure to follow West Deep Creek Road. Three miles after leaving the center of town, you’ll come to the Deep Creek entrance to the park. Well-marked trail signs lead you to three waterfalls: Juney Whank, Indian Creek and Toms Branch. The Juney Whank and Indian Creek trails have moderate slopes, while Toms Branch is the closest to the trailhead. Please use caution and obey all rules and warnings posted near waterfalls. The rocks around waterfalls are often slippery, and the currents can be very strong. 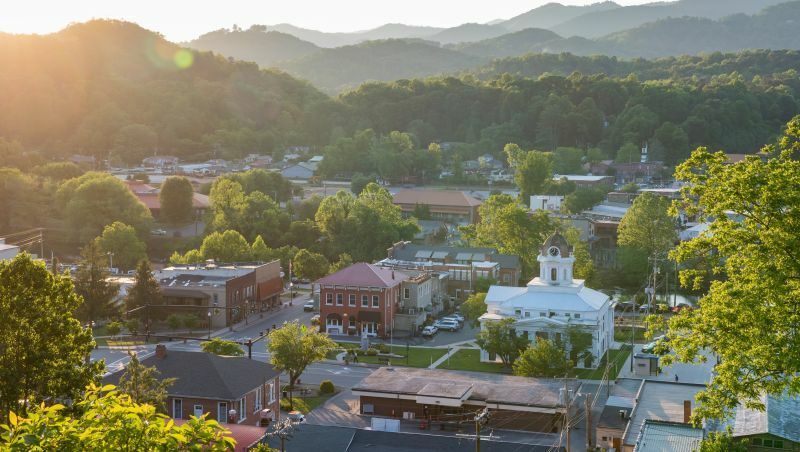 After your hike, park in town and walk to any one of Bryson City’s great lunch spots such as Jimmy Mac’s on Main Street, The Filling Station Deli and Sub Shop on Everett Street or Anthony’s Italian Restaurant on Depot Street. Spend the afternoon browsing the shops and galleries of Everett, Main and Depot streets. You’ll find stores full of antiques, artwork and crafts, or you can tour working artists’ studios like Elizabeth Ellison Watercolors. Finish off your in-town day with dinner at Pasqualino’s Italian Restaurant on Everett Street. If it’s summertime, stop in at Soda Pop's and eat ice cream along Everett Street just like the locals do. If you’re in town a Saturday June through October, catch the free Music in the Mountains concert at the train depot.